Starring: Daniel Craig, Harrison Ford, Sam Rockwell, Olivia Wilde and Paul Dano. In the Old West, a mysterious man (Daniel Craig) wakes up not knowing who or where he is. He’s been wounded in the stomach and has a mysterious metal bracelet attached to his arm that he can’t break off. After he escapes a group of bandits he rides back into town to heal up. But he brings attention to himself by taking out a thug named Percy (Paul Dano). Suddenly, people recognise the man as an outlaw named Jake Lonergan and he is knocked out by the mysterious Ella Swenson (Olivia Wilde) and winds up in a cell right next to Percy. When army Colonel Woodrow Dolarhyde (Harrison Ford) learns that his son Percy has been locked up, he rides into town with his men to free him. But the town is attacked by alien spaceships, which capture by people by roping them up into their crafts. One of the people taken is the wife of bartender Doc (Sam Rockwell). When it’s noted that Jack’s bracelet can shoot down the ships, Woodrow insists that he comes with the group including Ella, Doc and Nat (Adam Beach), an Indian, to try and get their friends back. 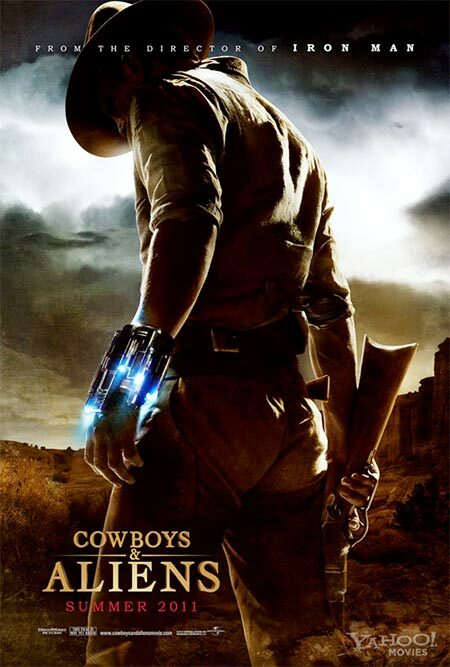 I’d be lying if I said I didn’t enjoy Cowboys and Aliens. It’s a ridiculous concept, melding the Western with science fiction and not one with any recent or memorable comparison. But importantly, what Iron Man (2008) director Jon Favreau brings to this comic book adaptation is texture. It surprised me what a violent and grubby film this is. That means that it’s not appropriate for small children but it does make for a more grounded Western. 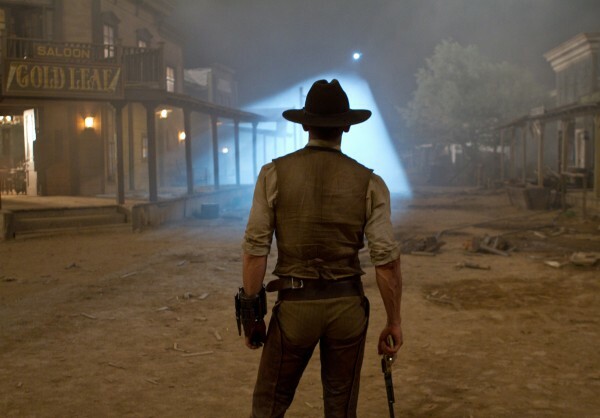 Out of all the ways to describe a movie called Cowboys and Aliens, I never imagined I’d be using the word ‘realistic’. But believe it or not, the characters in this film look and feel like real cowboys, hardened battlers of the frontier. Many of them are unshaven; they drink too much and engage briefly in torture. In one scene a man is tied to two horses as his limbs are pulled in two different directions. Even the early brawls in this film are more involving and intense than we usually expect from films like this because they’re shot cohesively and with some gravity. The cuts and the bruises here look real. I appreciated the attention to detail that Favreau decided to bring to this movie, instead of easy self-referencing. Any humour in this film arrives in just the right amount of doses. It never becomes a winking parody because the mood of this film and the performances play the concept straight. This allows the deadpan humour to come through more naturally, mostly thanks to some fun supporting roles by Sam Rockwell and briefly Paul Dano. They seem to be having great fun with some of their dialogue and they’re really enjoyable to watch and listen to. But the casting of Craig is particularly interesting. Robert Downey Jr. was originally was attached to the film because of the success he and Favreau shared with Iron Man. But Craig is, I think, a better fit for the movie. His weathered face and constant grimace evokes Clint Eastwood’s Man with No Name. He doesn’t bring any of the smugness that Downey Jr. would have. That means that there’s less jabs and winking at the source material. Instead, Craig makes himself effortlessly cool by snarling lines like: “Demons took your gold. When you get to hell, you can ask for it back”. Harrison Ford is in grizzled form here and really chews the scenery as the battle hardened Colonel. There is a little more depth and warmth to his character, because of his interactions with Nat, while thankfully avoiding much of the schmaltz of Super 8 from earlier this year. Olivia Wilde is merely serviceable but at least slightly more active than most female roles in movies like this. These characters aren’t as rich or romantic as the ones from Iron Man but they’re tough and humorous enough to be a lot of fun. The aliens are the least interesting part of the movie. This is where the film loses a lot of its gravity. There’s nothing particularly unique or interesting about the aliens. They have few weaknesses and not much personality. They’re just after gold. And not having read the comic book, I don’t know if the aliens are meant to be symbolic or allegorical. Favreau is not interested in that aspect. Some of their sequences have a few jumpy scares, which does add to the fun but others are just overdone or too farfetched. If you think the aliens are a stretch, wait till you reach the Indian campfire ceremony. There’s also a silly scene on top of a spacecraft and the last battle, like so many of these films, goes on far too long. That said, the action is very slickly handled and violent and the actors are engaging. I think a lot of comic book and video game fans are going to love this film.